Selling Infamous Houses is Murder! We’ve all heard lurid stories of infamous crimes, but what happens to the homes left behind by the criminals and victims? Let’s look at a few famous local crime scene houses, called “stigmatized properties” in the business, and see how they were (or were not) sold. Address changes might only fool the casual “murder tourists” who flock to these sites, but any amelioration of unwanted attention is worthwhile. OJ Simpson’s former home at 360 N Rockingham in Brentwood was changed to 380 N Rockingham to make it at least a little more difficult for Hollywood Star tour buses to find. Likewise, the condo belonging to Nicole Brown Simpson, where the actual murders occurred, went from 875 to 879. Both of the Manson murder houses underwent a similar change; The Tate address was changed to 10066 from 10050, and the LaBianca house from 6601 to 6611. Some savvy sellers even change the address so that internet searches won’t disclose the house’s macabre history. The second grisly Manson crime scene was at “The LaBianca House” on Waverly Drive in Los Feliz. 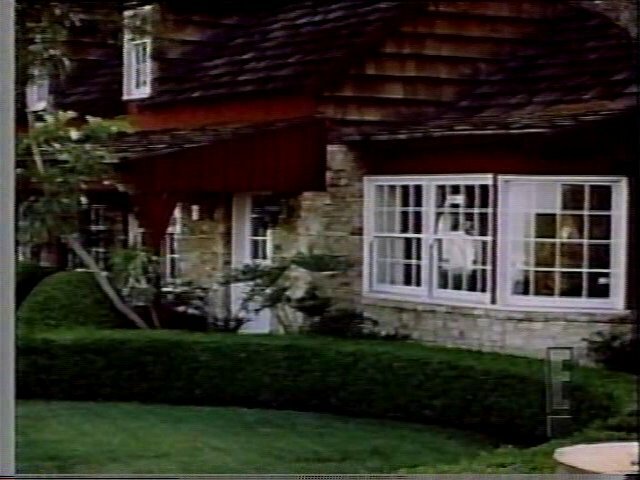 The house was the home of grocery store owner Leno LaBianca and his wife, Rosemary, who were both killed by the Manson family. Today the LaBianca house still stands. However, the curb shot has changed dramatically. Shortly after the crime, a Filipino couple rumored to be friends of Imelda Marcos bought the house, and they installed a towering Security Gate and built a big 4 car garage in front of the house, essentially hiding it from public view. 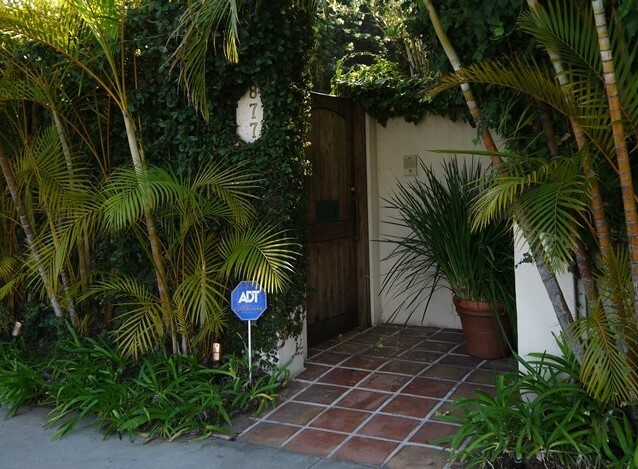 Similarly, the new owner of the Nicole Brown Simpson condo erected a wall at the entrance near the street, and changed the front gate and walkway. If you can’t sell your infamous property, and you don’t mind living there, maybe you can just move back in. This is exactly what the owner of the infamous Manson-Tate murder house did at 10050 Ceilo Drive in Beverly Hills. 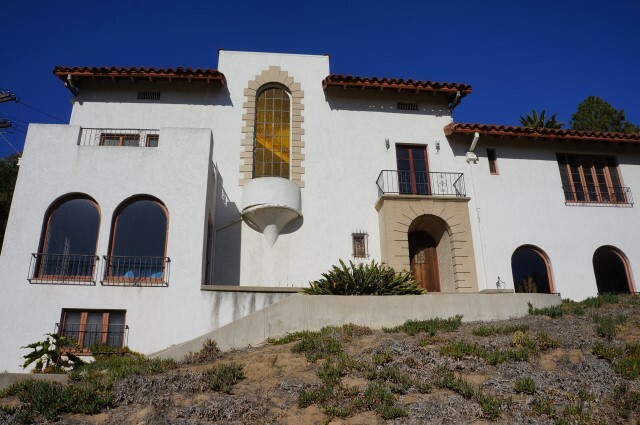 The owner, Rudolph Altobelli, was renting the house to Tate in 1969, and he moved back in just 3 weeks after the Manson murders, and then lived there for the next 20 years. He took the lay low and wait for the storm to blow over approach. 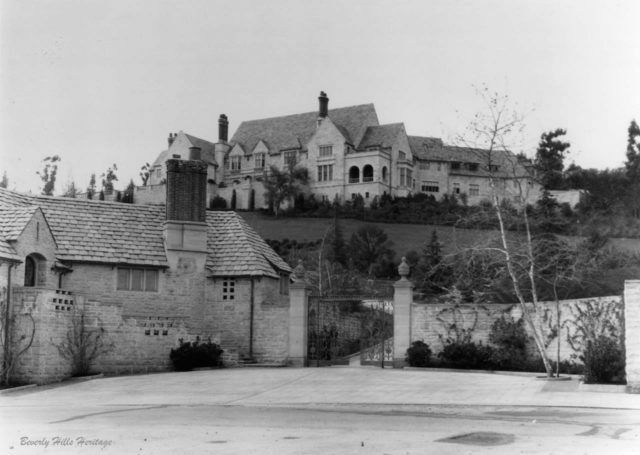 In 1929, just four months after Ned Doheny, son of oil tycoon Ed Doheny, moved into Greystone Manor in Beverly Hills, he was inexplicably murdered by his assistant, who then committed suicide. In 1965, the city of Beverly Hills purchased the building, also known as Doheney Mansion, and made it into a public park and venue for special events (one of my friends recently got married there). On April 23, 1976, the Greystone Estate was officially recognized as a historic landmark. The city’s use of Greystone and its grounds has removed most of the stigma, except for a few rumors of ghosts. The infamous Spahn Ranch is now part of Santa Susana Pass State Historic Park, which was classified as a State Historic Park in 1998. Sometimes you just have to accept the whims of fate. You can always turn the house into a tourist attraction, like the Kansas farmers who used to charge looky-loos $5 for a tour of the Clutter House, which was made famous by Truman Capote’s best seller, “In Cold Blood.” You can even turn the place into a B&B, like the Lizzy Borden B&B, where you can spend a cozy night in one of the the rooms where the murders took place, or the Villisca Ax Murder House in Iowa, where in 1912 an unknown attacker murdered an entire family and their two guests. You just have to wait around 100 years and hope that it’s haunted. 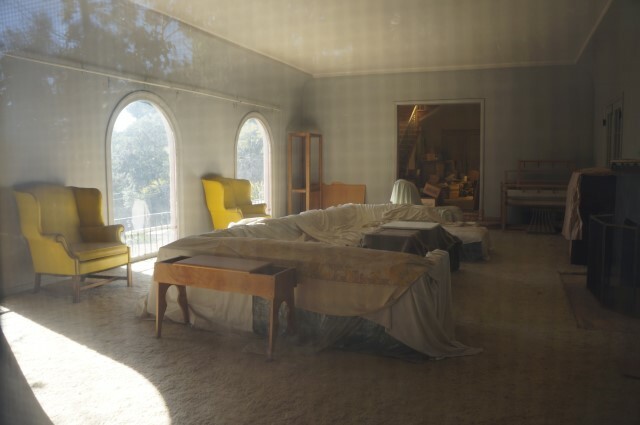 Los Feliz Murder House interior (Photo by Elise Thompson for The LA Beat). 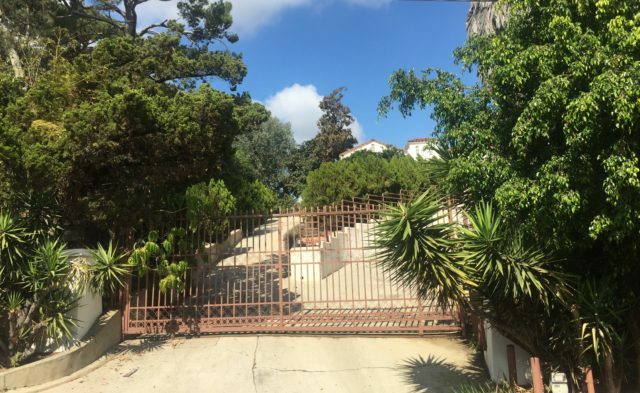 The famous “Los Feliz Murder House” at 2475 Glendower Place in Los Feliz has been shuttered for over 50 years, ever since Dr. Harold Perelson beat his wife Lillian to death with a ball-peen hammer before viciously attacking his 18 year-old daughter Judye and taking a fatal dose of hydrochloric acid. 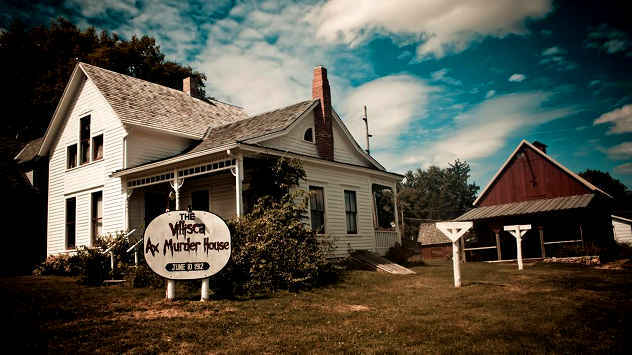 Rumor has it that the house is haunted, so the subsequent owner left it for the ghosts. The house sat still and silent for many years, until recently it came on the market as a probate and sold for around $2.3 million to Gloria Allred’s daughter in July of last year. Regardless of how you deal with your infamous property, there is usually some depreciation. In other words, don’t expect to make a killing. James Colin Campbell is a Los Angeles real estate blogger. He has worked in real estate for over 10 years. When he isn’t running all over town showing properties, James likes to attend music concerts, hike around various parts of LA, and take a trip to the Downtown Public Library once a month (usually at the behest of an overdue book notification). You can learn more about L.A. Real Estate on James blog, jamescolincampbell.com. Special thanks to Dearly Departed Tours. This entry was posted in Miscellanious and tagged Charles Manson, Doheney Mansion, Greystone, how to sell infamous houses, In Cold Blood, infamous houses, Lizzy Borden B&B, Los Feliz Murder House, Murder houses, Nicole Brown Simpson's condo, OK Simpson, Randall Bell, Rockingham estate, Spahn Ranch, stigmatized properties, Tate-LaBianca murders, the Clutter House, The LaBianca house, The Manson Family, Viscilla Ax Murder House. Bookmark the permalink. 2 Responses to Selling Infamous Houses is Murder! 10050 Cielo Drive was demolished in 1994.